The Unimog is a versatile all-purpose vehicle renowned for its off-road characteristics. The platform has been used worldwide for civilian and military purposes since the end of WWII, but it does not have the name recognition of the Land Rover or Hummer in the U.S. because they are not sold here (due to regulatory compliance issues). The naming conventions used for the Unimog can be rather confusing since they are sometimes described using the series number, and sometimes described using the model number, and sometimes just referred to as "Unimog" without any indication of series or model. I will use the series number when referring to specific types of vehicles in this post since the model number reflects the horsepower of the engine, and can be identical for two Unimogs from different series. All of the Unimogs that I currently own are diecast models. There are a number of resin and white metal kits of military Unimogs on the market, but since they are 3–10 times the cost of a diecast toy, I decided to pass on them for the moment. One of the oldest diecast models of the Unimog is the Matchbox toy from Lesney Products (blue). It dates to 1967, and has no given scale. Next to it is the Tomica Unimog (yellow) which is listed as 1/70 scale and slightly smaller than the Matchbox Unimog. These models represent medium-duty 406 series Unimogs (manufactured 1963 to 1989), and are ~1–2mm too long for a 1/72 model. However, any difference would probably be more apparent with respect to height rather than length or width. 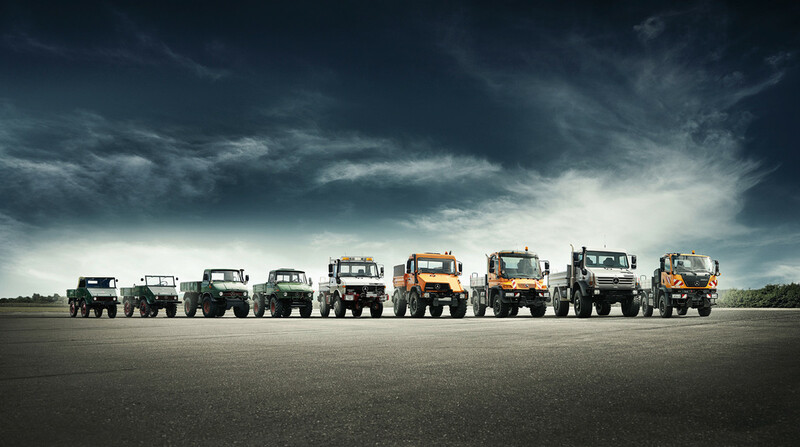 The next Unimog is a fire engine version produced by Atlas, described as a 404 series VLF (Vorauslöeschfahrzeug) Unimog. Not to be outdone by Altaya, Atlas also decided to attach the model to its base with a security screw system, but in this case I was able to remove them with a hex wrench. The 404 series (manufactured 1955 to 1980) has the long wheelbase, and was apparently popular with European and African armies. The wheelbase measurement of the model is almost dead-on for 1/72 scale. The side mirrors are very delicate, and I managed to break both of them while unscrewing the model. Luckily they were easily fixed with a little CA glue. The tow hook also fell off, and I only noticed because I found a small plastic piece in the carpet that looked like a model part. Definitely a display-only model. The next pair are a Majorette Unimog with green camouflage markings, and a Hot Wheels Unimog in desert camouflage. The Majorette model was packaged with a couple of knockoff Airfix German soldiers like the rest of their Series 220 Special Forces sets. I'm not sure if these models are supposed to be the heavy-duty 425 series, 435 series (both manufactured 1975 to 1993), or 437 series UHN (Hochgeländegängig) ‎(manufactured 1988 to present). However, most pictures of military Unimogs that I've seen appear to be from the 425 (aka model U1300) or 435 series (aka model U1300L). I've seen the Majorette Unimog described as being 1/82 scale (which sounds about right), so they're probably okay to use for 15mm gaming (though some might want to replace the monster truck wheels with something more suitable). The models are about the same size as the Matchbox and Tomica vehicles, but really undersized in both wheelbase and cab size if they are supposed to be series 425/435/437 Unimogs. The final models are Hongwell medium-duty 405 series UGN (Geräteträger) Unimogs ‎(manufactured 2000 to present). Hongwell also decided to make these models hard to remove from the packaging by using a screw inside a tube that was too narrow for my regular screwdriver. The Phillips head jewelers screwdrivers (< size 0) that did fit into the tube were too small to turn the screw (~size 1), so I had to use a slotted blade screwdriver to release the models. These are really nice models with metal cab on plastic undercarriage. The tilting bed with swinging tailgate is also made of metal. The wheelbase is ~52mm which scales out to 3.75m, but I'm not sure if there is a UGN with this length wheelbase, or if the model is off-scale. Last is a comparison shot of all the Unimogs from this post. I'm not sure if Roco-Minitanks did any of the earlier versions, but I'm pretty sure they did later versions with chunky cabs (the level of my 'tech'! ), in blue as police riot vehicles? But Roscopf did a charming little military-pattern soft-top/pick-up of the early Unimog in 1:100th wiich is tiny! And I think Kinder did one about 1:250th? A bit outside your scale brackets! The model train people probably have the largest selection when it comes to Unimogs. I think I remember seeing a first generation Unimog from Wiking(?). That was a pretty small model too. Yes! You're right - a little grey-green box with a tiny sort-of N-gauge driver! I always thought that Unimog was some sort of English abbreviation or brand. Turns out it's German after all. Huh. My dad was driving one for work and we sometimes came along with him when we were small.